As a beginner pickleballer, simple and effective is the key to finding your stride on the court. A lot of on-court practice – which includes practicing all the important shots – plays an important role in improving your pickleball skills. However, one of the most important shots to practice, mainly because it’s the only shot that starts each point on which you have the chance to score is the serve. Unlike the fast-paced nature of live ball action where you have to make decisions within split seconds, the serve is a unique time during the game that gives you total control. You alone can decide when and how you wish to hit the ball. But how can you improve your serve accuracy and gain absolute control of the pickleball court? 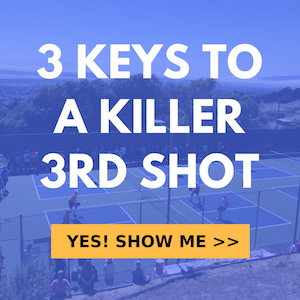 The purpose of this video is to give you clear and practical tips that can help you improve your on-court pickleball strategy – with focus on your serve accuracy. The tips are concise to enable you implement them during your next practice, but advanced enough so you notice the impact and difference right away. Unlike in Tennis, you must make contact and serve the ball underhand, below your waistline. In addition, you must hold your paddle below your wrist. Try to hit your target. In the shootout drill in the video, Jordan and his partner used small cones for target practice that were strategically placed deep in the middle and deep a few feet from the sidelines in each corner of the box. 3 cones in each service box so 6 cones total. You can also make use of a soda can or a cup for your drill. While these targets are super small, it’s great practice so long as you get close and in the area. Once you’ve got contact with the ball, ensure you follow through with your paddle so it points directly at your target. Keep it simple – release the ball. Simplicity is important here so you avoid throwing the ball or tossing it like a Tennis serve. Simply reach out and release or drop it rather than toss it. This is the highlight of the cone practice. A pickleball serve is most effective when it is deep into the baseline of your opponent. The deep impact strategy makes it difficult for your opponent to return the pickleball with authority. This strategy also makes it difficult for them to get to the net as quickly as possible, and the harder it is for your opposite number to get to the net, the easier it is for your game. The deeper your serve, the better. Jordan Briones highlighted the importance of mixing up your serve. “Try some top spin, some side spins and even some lobs” he says. Mixing up your serve keeps your opponent guessing, and this can give you a huge winning advantage. The goal is to practice. A consistent routine helps you find the rhythm that is just perfect for your game. Also, there is no such thing as the wrong or right routine, consistency is the key. The cone “small target” practice is just the ideal drill to perfect your serve.